Latinos are optimistic about the incoming Obama administration. Seventy-two percent believe that Barack Obama will have a successful first term, while 13% expect his first term to be unsuccessful. 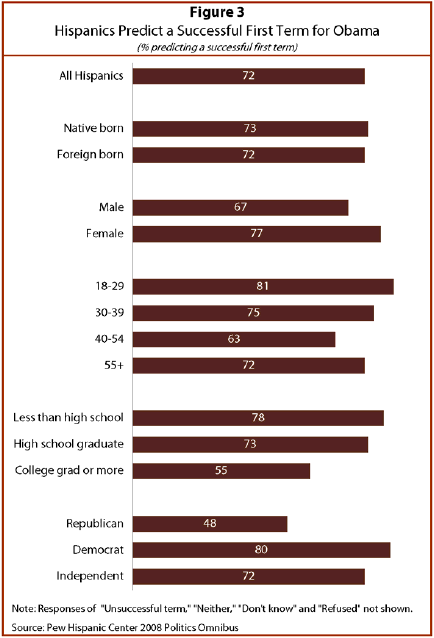 Both native-born and foreign-born Latinos hold equally positive perspectives on the Obama administration. Seventy-three percent of the native born foresee success for Obama, as do 72% of the foreign born. A sense of optimism is especially pervasive among young Latinos. Eighty-one percent of Latinos ages 18 to 29 expect him to succeed, compared with 75% of those ages 30 to 39; 63 percent of those ages 40 to 54; and 72% of those ages 55 and older. Latinos with less education are more positive about the incoming administration than are Latinos with a college degree. Nearly eight-in-ten (78%) Hispanics who lack a high school diploma and 73% with only a high school diploma foresee success for Obama, compared with 55% who have a college degree. Men are less optimistic than women about the future success of the Obama administration–67% versus 77%. Latinos rate the economy as a top priority for the new administration.3 Ninety-eight percent identify the economy as extremely (57%), very (38%) or somewhat important (3%). Education is also a top priority; 98% of Latinos see it as an important issue, and 51% identify it as extremely important. Health care ranks next, with 97% of Latinos stating that it is an important issue. National security (96%) and the environment (93%) are also high priorities on the list of political issues. Energy policy ranks relatively low among Hispanics compared with other issues, though a sizable proportion—87%—consider it important. 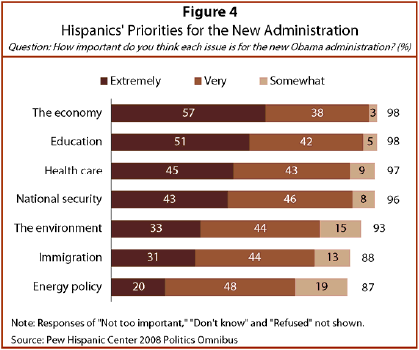 Among Latinos, immigration ranks near the bottom of the seven issues in order of importance, just above energy policy. However, while immigration is not identified as a top issue, nearly nine-in-ten Latinos (88%) cite it as important, with 31% considering it extremely important. Among immigrants, the overall concern with immigration is slightly higher: 89% state that it is an important issue, and about one-third (31%) consider it extremely important. In comparison, three-fourths (86%) of the native born cite immigration as an important issue, with 30% stating that it is extremely important.